Pet owners across the country, make it obvious in online pet forums that they each have their own agenda when it comes to pet health care and pet health insurance. They run from obvious, “Good food and annual vet checkups,” to cute, “I give them lots of love,” to impassioned. Many readers began to convey strong opinions on what pets should eat. Some feed kibble, some swear by raw, others feed vegan, and others serve homemade foods. And most feel very strongly about their cat insurance. Let’s take a moment to understand the basic makeup of a cat. Felines are obligate carnivores, the strictest form of carnivore. According to the Cornell University College of Veterinary Medicine, this means that cats “rely on nutrients in animal tissue to meet their specific nutritional requirements.” They need to consume high-protein diets and minimal carbohydrates to maintain proper pet health. So, apart from vet checkups and cat insurance, the best way to ensure proper cat health is to feed them high protein food with the right amount of all the other nutrients cats need. 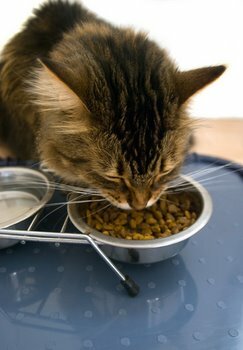 Ask ten vets what the best food is for your cat and you are likely to get a few different answers. It’s up to you to find a vet you can work with and whose recommendations you feel confident in. One veterinarian, Dr. Greg Martinez, wrote an award-winning book called the Dog Dish Diet that he says generally applies to cats, too. Although some people want to feed their pets what they eat themselves, it’s important for optimal cat health care to remember that cats come from a very different makeup than we do.